A medical center in Wisconsin does it. So, too, does a university in Maine. A naval base in California is very actively involved in it, as is a school district in Louisiana and the prison system in South Carolina. All of these commercial and institutional establishments do something virtually unheard of a decade ago: they collect steel food cans generated from their food service operations for recycling. More food service operators are establishing recycling programs in their facilities to properly manage their solid waste and to control disposal costs. In addition, by diverting additional material from the solid waste stream, these facilities can help communities meet state and local mandates for recycling. 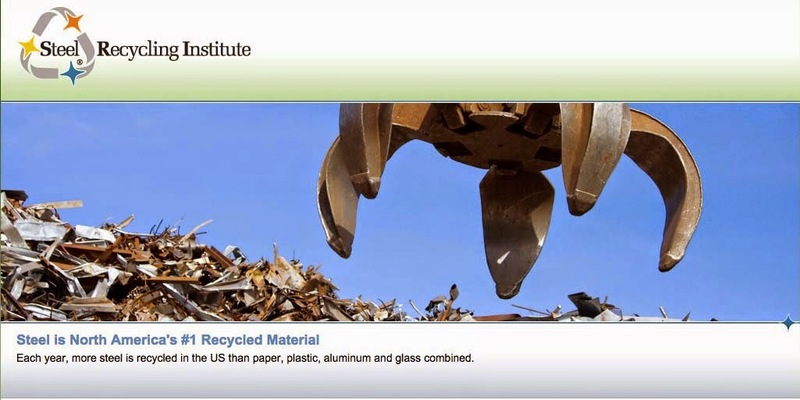 Of course, there are the underlying environmental incentives to recycling. Throwing away less solid waste conserves landfill space, natural resources and energy. All of these reasons are why many food service programs recycle steel cans, especially one-gallon steel food cans. One gallon steel cans look like large coffee cans, but may contain many different, sometimes surprising foods: sliced peaches, olives, cheese sauce, tomato paste, chocolate pudding and even chow mein noodles. Consumers are not very familiar with one-gallon steel cans because they’re not commonly seen on grocery store shelves. Why not? Just as a gallon of milk or a gallon of ice cream is a bit too much to consume at a single sitting, so, too, is a one-gallon can-full of sliced pineapples for example. An ordinary 16-ounce steel can, what you probably picture when you think of steel cans, serves four people. The one-gallon-sized steel can, on the other hand, serves approximately 25. So it’s likely that these cans do not regularly appear in residential recycling programs. However, one-gallon steel cans are ideal containers for use by the food service industry because they package bulk quantities of fresh foods in durable, stackable containers. Nearly 97 percent of canned food is packaged in steel, and food service facilities use millions of steel cans each year. Food service facilities prepare their meals with foods packaged in steel cans because of the many advantage the containers offer. The more than 1,500 varieties of canned foods require no cutting, thawing or pre-measuring. To lock in both freshness and nutrition, fruits and vegetables are sealed inside steel cans usually within just a few hours after harvesting. Of course, once a steel can is used, both the empty container and the trimmed lid are recyclable and are being recycled from food service facilities today. In addition to steel cans, there are many recyclable materials that are generated from commercial and institutional facilities. Food service operators should contact their waste hauler to determine what materials in the solid waste stream can potentially be recycled. Steel and aluminum cans, glass bottles and jars, plastic containers and cardboard are recycled in most recycling programs. Recycling programs established in food service facilities are sometimes referred to as “dockside” recycling programs, because most of the collected materials are stored in a container on the receiving dock for reasons of space, sanitation and shipping convenience for the hauler. Of course, a multimaterial dockside recycling program is the most efficient and has the best chance of reducing a food service facility’s solid waste disposal costs and helping a community to meet its recycling goals. How do food service operators determine what recyclables lie hidden in the solid waste stream? Simple: they open up the dumpster and take a look. Actually, poking around through trash has a very dignified name: conducting a waste audit. A waste audit helps estimate the percentage of solid waste a food service facility is generating that is recyclable, and it’s a step that must be taken before any other decisions can be made. It will help a waste hauler to obtain an estimate of the type and amount of recyclable materials being generated at the commercial/institutional establishment. In addition to recycling portions of their solid waste stream, food service facilities can also make an environmental impact by purchasing products made from recycled, recyclable materials. The steelmaking process requires old steel scrap, like steel cans, to make new steel. Therefore, all steel products are made from recycled steel. Steel cans contain approximately 25 percent recycled steel. Even the steel construction beams used to build commercial and institutional establishments are made from virtually 100 percent recycled steel.